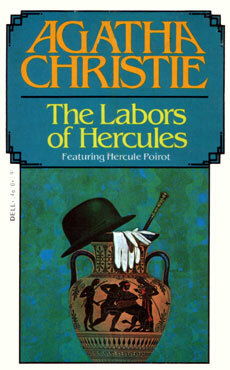 Agatha Christie's The Labors of Hercules develops the theme of her Belgian detective, Hercule Poirot, fancifully undertaking his own "labors of Hercules" in imitation of the fabulous hero of Archaic Greece. Poirot's labors diverge decisively from the original, though: they are miniatures or parodies of the Greek Labors. The book is a collection of twelve cases of detection, mostly not linked except symbolically in Poirot's mind. Making allowance for these being short stories rather than the novel-length mysteries in which Hercule Poirot usually appears, the stories are good and some quite clever. He had decided to take a holiday in Herzoslovakia so as to get right off the beaten track and have a real rest from everyone and everything. The hotel at Lake Stempka, though small, was comfortable and not overcrowded. The few people there were mostly foreigners. I rather like Herzoslovakia as the name for a Mitteleuropa country or province. Heracles's Sixth Labour was to remove the countless brazen-beaked, brazen-clawed, brazen-winged, man-eating birds, sacred to Ares which, frightened by the wolves of Wolves' Ravine on the Orchomenan Road, had flocked to the Stymphalian Marsh. Here they bred and waded beside the river of the same name, occasionally taking to the air in great flocks, to kill men and beasts by discharging a shower of brazen feathers and at the same time muting a poisonous excrement, which blighted the crops. Nevertheless Christie, as in all twelve of these lesser Labors, makes the connection work. Since I carry among my own inseparable mental baggage, Carl Barks' distinctive treatment of Harpy-like bird-women in his classic Scrooge McDuck adventure, "The Golden Fleecing", I took a perhaps atypical delight in this particular Christie story. So Agatha Christie's own The Labors of Hercules is not a novel, and designedly not of antique mythological stature; instead it is a collection thoroughly solid and neat, and even thought-provoking — thusly rather resembling Hercule Poirot himself — which I find quite enjoyable.